For anyone that's read a few of my reviews you know that I never steer too far away from the realm of movies, but this is one that had me intrigued. In all honesty I've never really been into TV shows at all and have only finished a couple of them off with a few famous ones still leering over my head. I wasn't even sure that I was going to watch this show as it did seem pretty good from it's trailer but never seemed like something I could invest myself in. Then the online articles started appearing, claiming that viewers of the show could not sleep from fear, that they passed out during viewings, and felt horrible anxiety at all times. I was intrigued and even more so when I found some reviews claiming that this series is one of Netflix's best. At this point I knew I had to watch it and see for myself. Reviewing a TV show is something completely new to me so bear with me if this isn't a decent read the first time. I'll be keeping this spoiler free and as short as possible. Should point out that this is Netflix only for anyone wanting to watch. 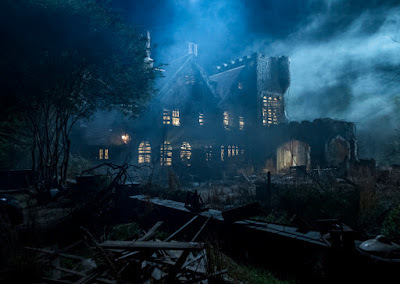 So we start off right in Hill House back in 1992 as a teenage boy is awoken by the cries of his little sister from another room. He goes to investigate and finds his sister, Nell, is scared by a ghost she thought she saw, one known as 'break neck lady'. Her father appears to calm her down and puts her back to bed. I won't mention what happens next but it's an early indicator of how truly nightmarish this series could really be. Good luck sleeping. We cut to 2018 and see what the kids from 1992 (all five of them) are up to. A couple of them such as Steven, Theo and Shirley are doing well for themselves in the fields of writing, psychology and mortician work respectively, while the others, Luke and Nell, are either in rehab or...... well I'm not quite sure yet. The plot of this episode revolves around Nell trying to get into contact with the rest of her family for an unknown reason other than thinking that there might be something wrong with her brother Luke. It all seems to stem from childhood trauma of living in Hill House and through her supernatural experiences which are likely to give nightmares to some viewers. It almost plays out like Stephen King's IT as we do go back and forth between 1992 and 2018 as we see how the events of the past are now affecting the future and how each of the kids seems to have a different experience. For a first episode it does it's job very well by introducing to a few characters and having them be memorable in their own way while also driving this mysterious story onward and making you ache to find out what happened in that house all that time ago. It doesn't go overboard with the scares and delivers them at just the right time. There's no cheap jumpscares to be had here, just intense atmosphere and a spilling of dread to wash it down with. There was actual one jumpscare but it furthered the plot so I'll give it a pass. Overall I'd give this a recommendation if you're looking for something spooky this Halloween and I'm hoping the rest of the series lives up to the good buildup we've had from this one. No rating until the end of the series.